Brand new from TEAC, the UD-505 includes a dual monaural USB DAC, headphone amplifier, network player and Master Clock Generator. 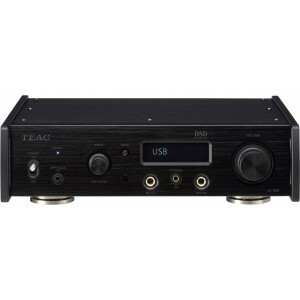 TEAC UD-505 is a dual monaural USB DAC and fully balanced headphone amplifier that condenses TEAC's audio design expertise cultivated over many years in a compact A4-size enclosure and the high-end audio design philosophy. With the "RDOT-NEO" (Refined Digital Output Technology NEO) using the fluency algorithm to smoothly complement the digital audio signal, it has the function to up-convert the PCM digital signal up to 384kHz and the maximum DSD 24.5MHz. When sending a huge amount of digital data of a high-resolution sound source with the USB cable, USB transmission technology "Bulk Pet" enables stable data transfer. This is attained by averaging the load on both processes. Sound quality changes with the load condition of the PC, so you are able to choose from the four pre-set transfer modes. On the front side, in addition to the headphone output terminal by two 3-pole TRS jacks that can be balanced, a new standard that realises stereo balance connection with one plug 4.4 mm 5pole terminal is included. This adopts "Pentaconn" for balanced headphone jacks. It is a circuit configuration that can enjoy the difference of sound by three kinds of driving methods such as active / ground and driving. A three-point support type leg enables stable installation of the main body unaffected by the slight distortion of the floor surface. By supporting the main body only at a very small point, it reduces vibration and resonance, thoroughly eliminates mid and LF distortion for a resolution and sound image localisation that emphasises the soundstage. When lifting the main body, the flange meshes to prevent the foot base from falling, and when it is grounded, it makes pin point grounding where only one point of the spike tip and the deepest part of the mortar comes into contact.